Please refer to our stock # Mil04 when inquiring. NEW GERMAN AIR FORCE LUFTWAFFE COMBAT PILOT CHRONOGRAPH - 24 HOUR REGISTER. 41 Millimeters without the crown case end to case end. This watch was created to celebrate the rebirth of the German Luftwaffe in 1958. At that time, the F/A-18 was provided by Americans to the German Air Force. The "Cold War" in Europe was at its height in 1958. This is an official New German Air Force authorized chronograph of the highest quality combat rugged Caliber OS20 Quartz movement. Featured is a single function 30 minute chronograph. Also featured is a continuous rotating 24 hour register. Synthetic Sapphire Crystal. Certified for use with the German Air Force KAMPFFLIEGER. It is new in the military PX box with instructions for use. this watch is a 30 minute CHRONOGRAPH with a 24 hour register. Which means that although the 24 hour advances, it does not return to zero when the chronograph feature is canceled. DIAL: Black background with white military bold Arabic Florissant figures and is marked: "KAMPFFLIEGER/CalOS20/FLUGZEIT CHRONOGRAPH"
MOVEMENT: Hack Set Cal. 0S20 Movement. Features spring back Hands. 32,768 Hz. Tuning fork type solid state Quartz. Chronograph use is presented with a instruction manual with displays and buttons. 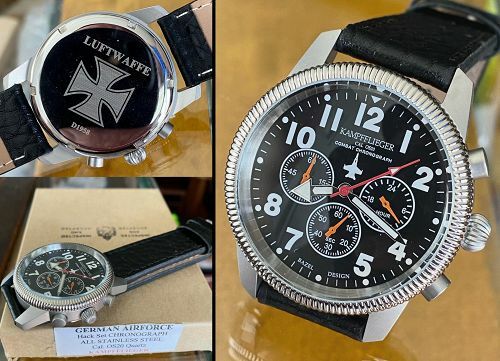 CASE: Size: Stainless brush finished screw down back, etched with the German military traditional IRON Cross and Date and marked: "LUFTWAFFE/C 1958"
We have been selling vintage watches on E-Bay since 1998 as watchco1974 with 9000 feed backs, 100% positive. You can buy from us with confidence. OTHER NICE FEATURES: Free U.S. Shipping. $18.00 overseas.